Pengguna hijab di Indonesia yang makin banyak, terutama hijabers muda, sedikit banyak dipengaruhi oleh tren hijab non-konvensional yang go viral melalui internet dan media media. Modest Fashion Indonesia kembali menunjukkan reputasinya di ajang internasional, kali ini label ETU mempersembahkan koleksinya pada event Virgin Australia Melbourne Fashion Festival. A decade ago, when I started wearing hijab, we almost needed nothing but a square simple scarf and a pin. Everyone wore the same hijab style, and the only innovation made was an instant veil. Well nowadays we’re stunned by the never ending innovation in hijab style, fabrics or any accessories attached. Everyone strives to find their own style, based on their personality, yet simple is still the key for wearable hijab style. And for today’s style, I think these essential kit is a must have for us hijabers. Inner, Some of us would call this as Arabian inner, since it sticks to our forehead (the other inner we usually have the older days was awning inner, has rooflike extended material so it makes space between the forehead and the edge of the inner). Cotton inner with good stretchy material will be the best choice. Headdress, mostly call them ‘inner Ninja’. It covers our face perfectly, including our neck. Some headdresses also cover our upper chest, so worry not when wearing any top with low neck line. Put this on first, then you’re free to attach your veil in any way you like. No hassle. Use cotton material to ensure comfort. Pins, No hijab kit is complete without some safety pins and straight pins. Hijab bun or big hair clamp, (imagine having bun in our head, LOL!) well it’s ‘cepol’ in our term. I prefer using full hair clamp, as it’s more lightweight and stays in place. It adds extra volume and gives elegance to your hijab. The bun/clamp can be worn under a hijab to hold hair and give extra volume. For my personal views, pick the moderate size of bun, not too big. And of course, some square or rectangular shawls. Some plain shawls in many colors, or patterned ones I guess were already there in your drawer. 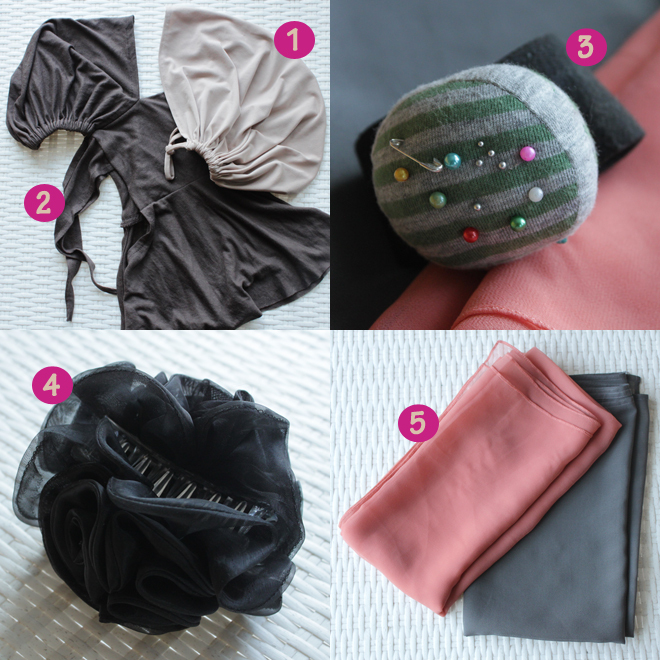 With these basic kit, you’re ready to create a stylish hijab look! And what about some tutorial on simple yet twisting hijab style? we’ll have it featured on next article!